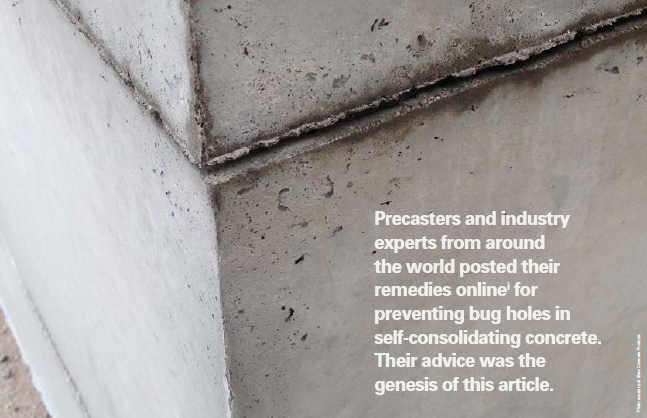 Like a persistent mosquito, one question has plagued precast concrete producers for years: “How can I eliminate bug holes?" In the past, this question was much harder to answer, because concrete was placed at a stiffer consistency that required excessive vibration. And excessive vibration sometimes caused more bug holes. After the introduction of self-consolidating concrete (SCC), bug holes(ii) became a less common occurrence. Yet, as a recent online industry discussion revealed, this perturbing problem is still with us. 1. Chemically reactive agents: When a chemically reactive form release agent is used, a nonviolent chemical reaction takes place when fatty acids react with free lime on the surface of fresh concrete. This reaction results in the formation of a metallic soap, a slippery material that allows air bubbles to rise along the vertical surface. This “soapy” film also prevents the hardened concrete from adhering to the forms during stripping. 2. Barrier release agents: Thicker coatings on forms are typical of the older barrier-type materials, like heavyweight used motor oil, vegetable oils, diesel fuel and kerosene. Barrier type release agents are less expensive than chemically reactive agents, but they are not generally recommended for reducing SCC bug holes. 3. Maintain forms in clean condition.